Thoughtful and provocative by turn Jimmy Eat World are one of those bands who might confuse the mainstream but exert a particular hold on their fan base who recognise their passion and adore their cult status. We want to share them with you however and point you towards such crystalline epics as the album Bleed American where fervent patriotism runs into cool headed self analysis as well as the overlooked masterpiece Clarity and the modest classic Static Prevails, slow burning punkish rock from this Mesa, Arizona outfit that are chock full of high end melody and the distinctive ambition of brand leader Jimmy Adkins. 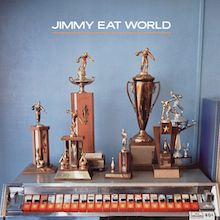 Often expanded and remastered for maximum value the Jimmy Eat World catalogue is highly recommended since it’s stuffed with tracks that may have slipped through the net but deserve far-wider appraisal. A renowned live act to boot, this stable four-piece has platinum discs in their locker and thrives in a world where aggressive alternative sound is demanded. If they’ve been saddled inside the Emo camp before that doesn’t actually alter the fact that songs like “The Middle” and “Pain” provide relief for tough times. Since they’ve been on the scene this past twenty years they’ve perfected their sound, added keyboards and female backing vocalists, moogs, cellos and delicate programming. They are way beyond emo-core now and prove that musicians of their calibre have every reason to evolve. Check them out. Go back to 1993 to find the origins of Jimmy Eat World. Guitarist and emergent songwriter and singer Jim Adkins and drummer Zach Lind joined forces with guitarist Tom Linton and original bassist Mitch Porter, their aim to create a post-punk repertoire that was partially influenced by fellow Arizona natives Horace Pinker. A local groundswell led to their self-titled debut disc, a formative affair that doesn’t quite prepare one for what’s to come. On Static Prevails (1996) the formula begins to click. The tunes have a radio-friendly feel (and that isn’t a criticism or a crime) and the makings of a smash hit in “Rockstar”. The songs are crisp, the playing excellent. But it’s on Clarity that the world begins to catch up with them. Here they sustained cult success and won over a lot of people who hadn’t been exposed to them before. With producer Mark Trombino exacting first class performances and Adkins moving into the driving seat they happened to make an album that has since been called the Led Zeppelin IV of emo-rock with modern-day bands flocking to pay homage and declare an influential interest. Stand out tracks are everywhere but we’re still amazed by “Lucky Denver Mint”, “Just watch the Fireworks” and the epic and lengthy punk prog pearl “Goodbye Sky Harbour”. Adding strings and sequencing to the mix Clarity is a disc that has not only stood the test of time but also improved with age. Look for it with the bonus tracks, including the demo for the totally hook laden “Sweetness”. Classic pop music. So well-received in fact that in 2009 the Jimmy boys embarked on a 10th anniversary tour where they played the album from head to toe and then self-released Clarity Live to mark the occasion of their triumphant Tempe, Arizona show. Not keen to rush their muse Adkins and company waited two years to create Bleed American, sharing the controls again with former Drive Like Jehu drummer Trombino. Another stunning work they were now rewarded with Platinum status in the US and Canada and built a sufficient British fan club to go Silver. Consistent, sprawling and spacey the new batch of songs includes the title track, later renamed “Salt Sweat Sugar” in the traumatic aftermath of 9/11, and the commercially charming track “The Middle”. Increasingly eclectic, one can hear echoes of Weezer, AC/DC and Tommy James in the melodic and rhythmic breakdowns. The Deluxe edition is significantly expanded with demos from English and European singles, tasty live treats like the title cut recorded in Australia, and other material that had been unreleased for seven years. 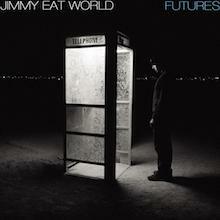 Jimmy Eat World’s fifth studio album, Futures (2004) is another Gold seller thanks to the airwave hits “Pain”, “Work” and "Futures" itself; British producer Gil Norton (Echo and the Bunnymen, Pixies, Foo Fighters, Terrorvision et al) took over the desk and gives the sound a polished, romantic surge in keeping with the new decade. "Work" features the vocal talents of Liz Phair, fresh from her own masterpiece Exile in Guyville, and makes full use of the band’s affinity with college kids kicking against the establishment in the video, although Adkins states it could just as easily be about a workplace affair. All three tracks scored high on Billboard’s Modern Rock chart and the band’s arrival is now a fact. Again expanded versions are available. Chase This Light (2007) was executively produced by Butch Vig with David Campbell (Beck’s father) providing string arrangements. This album raced to the Top 5 and is still selling well. Stand out cuts include “Big Casino” and “Always Be”, thrusting pop rock intensity with sharp lyrics and superb dynamics. Increasingly sophisticated by time but not losing sight of their initial energy, the Invented disc is a must-hear thing. Trombino returns to the fold and overall confidence is rebooted by melodic rock-outs like “Coffee and Cigarettes” and “My Best Theory”. An economy of song scale recalls their earlier work but the ability to connect emotionally with the listener is so apparent that the tracks live on beyond their duration. It’s Emo Jimmy, but not as we know it. So to Damage, their adult break-up record. The sonics change again here, largely because regular Queens of the Stone Age collaborator Alain Johannes is on hand to crank up the guitars. Rough and noisy in places, the home recording gives this album an organic, stripped back appeal. Remarkably, considering the general cynicism meted out to bands who have lasted the course this long, Damage has gained Jimmy Eat World’s hottest reviews and we reckon that resistance is futile. In fact for once it might be worth starting with this disc and then working backwards. Over to you. Full credit to Jimmy’s boys for sticking around and getting better, not an easy feat to accomplish. Ageing up nicely is a special trick they have. Punk, emotion, power pop and straight down the line rock and roll are all within their compass. In the event you’ve not become familiar with Jimmy Eat World it seems you are in for an eye-opener. Happy dining. 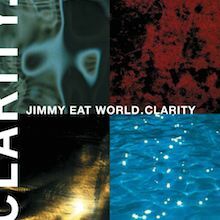 With their third album Clarity being one of the most overlooked masterpieces of 1999, Static Prevails is Jimmy Eat World paying their dues in 1996. It could be the slight over-production (a curse that has always haunted the band), being on a major label for the first time, or them trying to get a feel for pulling fancy studio tricks (i.e., numerous backing vocals, cellos, and Moog additions). 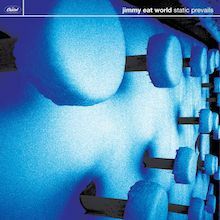 Maybe it's all three, but what Static Prevails essentially lacks is the songwriting maturity that Jimmy Eat World could have perfected; but it's almost as if the studio heads at Capitol wouldn't let them so that there would be more room for radio-friendly pop songs. In the end, nobody won. However, tracks such as "Anderson Mesa," "Call It in the Air," and "Seventeen" don't cross that line of boring alternative rock but remain in that aggressive pop status. Nothing close to classic, but definitely a sign of better things to come. On the heels of their self-titled EP in late 1998, Jimmy Eat World released their breakthrough album Clarity in 1999 and took up the mantle of emo poster boys. Deftly produced by Mark Trombino and the band, Clarity mixes introspective balladry with power-chord punk rock, elements of chamber pop, and subtle doses of electronica to create a remarkably unique album. The only single to garner radio play, the hard-edged yet poppy "Lucky Denver Mint," was also featured on the soundtrack to the Drew Barrymore film Never Been Kissed, and while the album reached an audience that far surpassed Jimmy Eat World's previous efforts, it was by no means a commercial smash hit. The band's punk influences are evident on "Your New Aesthetic," which decries the commercialization of radio as effectively as any song since Elvis Costello's "Radio, Radio." The other songs are more personal and poignant. Using string ensembles, drum loops, chimes, piano, vibraphones, and tight vocal harmonies to create intricately layered songs, Clarity alternates between hypnotic and hard rock, often in the same song. The snarl of "Blister" and "Crush" are counterbalanced by the understated beauty of "Table for Glasses" and "On a Sunday." However, most of the tracks mix both ends of the emotional spectrum with dramatic effects. The sweeping "Goodbye Sky Harbor," which clocks in at an epic sixteen-minutes-and-eleven seconds, starts off as an up-tempo romp, but evolves into an expansive piece of dream pop that includes vocal loops, several layers of delicate electric guitars, bells, and a drum machine. Heartfelt, yearning vocals from Jim Adkins and Tom Linton tie the songs on Clarity together and set them apart from other post-grunge rock acts. Neither vocalist is afraid to wear his heart on his sleeve, but both pull it off without sounding wimpy or overly forlorn. They are also versatile enough to belt out the more aggressive tunes. Trombino also deserves praise for helping to brilliantly balance excellent songwriting and traditional rock elements with adventurous production and unique instrumentation. The massive success of Jimmy Eat World's 2001 Bleed American propelled the band into the mass-culture spotlight, with the hit single "The Middle" seemingly popping up in every third movie released and the group turning in an energized performance on Saturday Night Live. Many, many groups followed in their wake, crafting a similar blend of melodic, anguished punk-pop and leaving Jimmy Eat World in the position of crafting a follow-up that set them apart from their acolytes. Futures gets around this dilemma in two ways. First, with the help of producer Gil Norton, the band polishes its sound until it shines like a slick '70s arena rock record. The guitars are stacked like thick diamonds, the vocals are way out front and buttressed by sweet harmonies in the choruses, the drums sound large, and the mix is loaded with sweetening from acoustic guitars, keyboards, and female vocals. In the process, they sacrificed the immediacy of the previous record, but they gained an epic and weighty feel. Secondly, the lyrics are much darker and more mature, including themes that revolve around politics, drugs, and despair. The piano-and-feedback ballad "Drugs or Me" and the bittersweet love song "Night Drive" are the products of age and experience the band lacked until now. The best song on the record, the very Disintegration-era Cure-sounding "23," seems like it was recorded by a different group entirely. Some things have remained the same, however. Jim Adkins' vocals are as intense and heart-tugging as ever, and the band still writes hooks that will have you singing along before the song is half over. "Just Tonight," "Futures," and the AC/DC-sampling "Pain" are all trademark Jimmy Eat World punky pop/rockers with anthemic choruses, while "The World You Love" and "Work" display the sweetly melodic side of the band. There are a couple of stumbles (the decision to replace Petra Haden's charming vocals with Liz Phair's, the generic "Nothingwrong"), but they don't detract from the overall power of the record. Futures will most likely not be the sensation that Bleed American was -- it is too dark and inwardly focused for that -- but it shows a progression of sound and emotion that fans of the band should embrace. Jimmy Eat World were sitting on top of the emo-pop world before the release of their last album, Futures. Its dark, inward-looking, and more mature-sounding songs didn't wreck their career, but the record didn't exactly further it, either. With Chase This Light, the band returns to the straightforward, hooky, and radio-friendly sound of Bleed American and lightens things up in the lyric department in hopes of recapturing its position in the marketplace. They aren't exactly singing about sunshine and lollipops, mostly love problems and the ills of society, but the cloud of gloom that settled over Futures has lifted. The band is back to following the rough template of Bleed American and the albums that came before it, with a mix of rousing anthems like "Big Casino," "Electable (Give It Up)," and "Feeling Lucky;" melancholy rockers with singalong choruses like "Always Be" and "Chase This Light;" and sweet ballads like "Carry You" and "Dizzy" (which strangely sounds like an outtake from Def Leppard's Hysteria). Only the moody and dark (with strings) "Gotta Be Somebody's Blues" hints at the mature sound of the last album. Chase This Light isn't Futures, Pt. 2, but it also falls short of being another Bleed American. Partially, it's Jimmy Eat World's obvious desire to go back to the sound that made them huge that does them in -- that kind of desperation move is rarely successful and it doesn't work here. Partially, it's the feel of the record. The polished and groomed-to-perfection sound is huge, dry, and airless, the controlled and note-perfect vocals lack passion, and the overall lack of imagination is disheartening. Simply put, it's a bland-sounding record, which is too bad because Jim Adkins really does have a knack for writing good pop songs. With a little more punch or soul, "Carry You" and "Feeling Lucky" could have been special. As they are, all they can manage to be is pleasant. Only the ultra-light and poppy "Here It Goes" manages to stand out, thanks to its goofy handclaps, synthesized voices, and loose backing vocals. 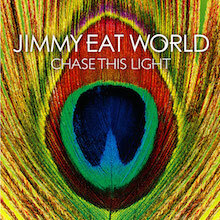 A little more willingness to take chances like this would have served the album well, since a combination of slick sounds, surprise-free arrangements, and pleasant tunes on Chase This Light makes Jimmy Eat World the emo version of Bon Jovi -- that's to say, nice to listen to and vaguely uplifting, but ultimately empty on the inside. 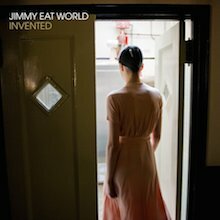 Jimmy Eat World have proven they can do better than this and they may yet, but this album is a bit of a disappointment.